Our Annual Appeal is our most important fundraising campaign of the year. We are only $12,000 away from reaching our current Annual Appeal goal of raising $225,000 by February 1. We urgently need your help. Every dollar from donors like you goes directly to program costs and helps set more women and families on the path to overcoming extreme poverty. Please join us. We go beyond “impact.” Our goal is to effect real systems change with a proven, replicable solution for breaking the cycle of extreme poverty in the drylands of Africa. We are working with governments and other NGOs to embed the poverty graduation approach into humanitarian programs and social safety nets to achieve sustainable, long-lasting systemic change. We invest in local leadership. Our 130+ team members in Kenya represent 11 different ethnic communities. At the community level, our program is delivered by local residents who live in the villages where we work. Together, they bring a wealth of knowledge, experience and deep cultural understanding to their roles. We use innovative technology for data-driven solutions. Our proprietary cloud-based data platform, Performance Insights, allows us to collect, monitor, evaluate and respond to thousands of data points across our program. We can see in real time what is working and what’s not, ensuring that our participants get the support they need. We go to the hard places. 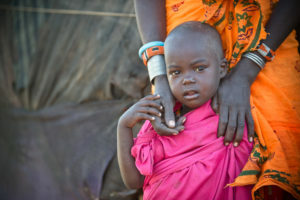 We target the most remote and challenging locations in the drought-ravaged arid lands of Africa, which are home to half of the world’s extreme poor. The counties where BOMA works suffer from some of the world’s highest poverty rates. A recent baseline of BOMA participants showed an average daily household income of $0.33. Our rigorous commitment to transparency, accountability and results. Our program meets the strictest standards of world-class foundations and organizations, such as Impact Matters, The Bill and Melinda Gates Foundation, GuideStar, USAID and seven members of Big Bang Philanthropy, a group of like-minded funders working together to find and finance great organizations tackling the most pressing problems of the poor. We work at the intersection of four critical UN Sustainable Development Goals: ending poverty, eradicating hunger, combating gender inequality and mitigating the effects of climate change. This global campaign recognizes that ending poverty must go hand-in-hand with strategies that build economic growth and address a range of social needs, while tackling climate change and environmental protection to improve the lives of people everywhere. We empower women and girls to become agents of change. When women achieve agency, they go from being liabilities dependent on aid to being self-sufficient, productive assets. Putting women at the center of our program creates transformation not just in their own lives, but within their larger communities. We have committed supporters who share our vision. Every year, we ask our donors to continue on this journey with us, and every year they do, driven by their belief in our program and the results that prove that their contributions really do make a difference. Our donors make it possible for us to innovate, expand, and keep pushing towards our goal. We care. Deeply. The work is hard. The obstacles are many. But the need is great, and the impact that can be achieved is profound. We cannot stand by knowing that change is possible. So we keep working towards our vision. And we thank you for joining us.